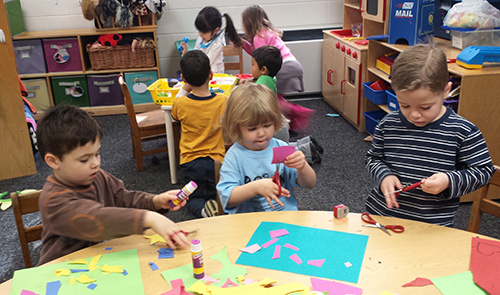 Dulin is a play-based cooperative preschool run by parents and professional teachers. We are committed to nurturing the unique assets of each child during the precious preschool years. Joining your child in the classroom and participating in the administration of the school – combined with the added benefit of low tuition – sets Dulin apart from other schools. Do you value parental participation in the classroom? Parental participation in our classroom is the cornerstone of our school. Parents do not replace professional, certified teachers — rather, they serve as teacher assistants in their children’s classes on a rotating basis. Your shifts in the classroom — roughly twice per month — give you the opportunity to observe teachers and lessons firsthand, see how your child is progressing, and get to know his or her friends. Would you like to be involved in how your preschool operates? Dulin Preschool families oversee all school operations, from hiring to budgeting to purchasing to maintenance to admissions. We attract talented individuals who are happy to share their particular skills — or open to learning new ones. Your role at Dulin Preschool may be as straightforward as participating in monthly classroom cleanings or as ever-changing as handling paperwork and giving tours. If you have questions or concerns about the preschool’s operations, you have the power to initiate or institute change. Because we are all parents, we view school issues through the eyes of parents, not just as administrators. Are you looking for a well-rounded preschool experience for your child? Dulin Preschool is a play-based preschool. Our curriculum is carefully designed by our teachers and teacher-director — educational experts who recognize the value of play and respect each child’s individual learning style and development. Children are allowed time and space to explore their world, discover new skills, and learn how to function as a group and on a schedule. Academics emerge organically through experiential play, crafts, music, and story time. Our curriculum is secular; there is no religious component. Would you like to send your child to an outstanding preschool without spending a fortune? One of the many benefits of our cooperative model is that it helps keep our operating costs low. At Dulin Cooperative Preschool, parents donate their time as administrators, classroom assistants, and more. This allows us to provide an excellent teaching staff and terrific facilities, all while keeping our tuitions affordable. Would you like to be part of a great community? 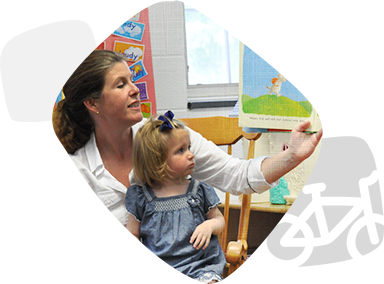 At Dulin Preschool, you very quickly become part of a strong, supportive community. Committee or board work, classroom shifts, and drop-off/pick-up times are opportunities to meet your child’s teachers, friends, and their families. Firm friendships have often resulted from Dulin Preschool ties, and many of our parents return as teachers and substitutes in later years. Social events such as the annual fundraising auction give parents some adult-socialization times too! Dulin Cooperative Preschool has three large, above-ground, sunny classrooms. With our larger-than-average classrooms and small-by-design class sizes, our classrooms are inviting and welcoming to children who may not be used to being part of a large group. Each classroom features a private bathroom with kid-sized fixtures, plus a door leading directly to the fenced playground. Our playground has modern climbing equipment, a hard-top area for tricycle-riding and chalk-drawing, and lots of structures perfect for imaginative play. Our well-stocked shed contains tricycles, ride-on toys, balls, shovels, and other playground equipment. On days when outside play is impossible, our indoor Rainy Day Room is the place for active play. This large, carpeted room features mats, climbing equipment, and small toys. 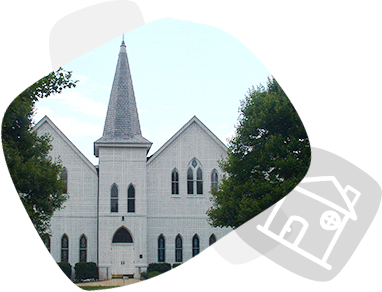 Like much of Falls Church City, Dulin United Methodist Church is a historically significant structure with a fascinating past. We feel fortunate to be housed in a building that has been a prominent Falls Church landmark for almost 150 years! Dulin’s first sanctuary was built in 1869 at 513 E. Broad Street, on a site given to the church in 1867 by Willliam Y. Dulin, a prominent landowner. Since that time, the church has undergone several periods of additional construction, including the school wing used by Dulin Cooperative Preschool, and a major renovation to the sanctuary in 2004.